Freshkote eye drops offer relief to many people suffering from dry eye. These lubricating eye drops are specially formulated to treat chronic dry eyes and imitate the three fundamentals of healthy tears. But, before we get into that… let’s talk about dry eyes. The reason you’re likely interested in Freshkote in the first place. Do you often find yourself suffering from eye irritation or even inflammation? If so, you may suffer from dry eye syndrome. Dry eye syndrome, also referred to as DES, is a common eye care problem that is caused by an inadequate moisture and lubrication on the surface of your eyes. Not only are dry eyes irritating and disruptive, dry eye syndrome can also lead to scarring on your eye’s surface if left untreated. Dry eyes can appear to be red and feel scratchy. Dry eye syndrome is one of the most common reasons that Americans head to the eye doctor. According to an online pool, 48% of all Americans experience symptoms of dry eye syndrome. There are three main forms of dry eye syndrome including keratitis sicca, keratoconjunctivitis sicca, and dysfunctional tear syndrome. Keratitis sicca describes dryness and inflammation that affects only the cornea, while keratoconjunctivitis sicca describes cases of dry eye syndrome that affect both the cornea and the conjunctiva. Dysfunctional tear syndrome describes dry eye syndrome that is caused by a low quality or quantity of tears. That’s where Freshkote comes in and helps, by imitating the natural tears your eyes should make. What are Freshkote Eye Drops? Freshkote lubricant eye drops are made specifically for people who suffer from chronic dry eyes. This brand of eye drops works by mimicking the three components of healthy tears. Freshkote is made from a patented polymer blend and a preservative that creates a protective layer that mimics the oil, water, and mucous layers that protect the eyes. Freshkote prevents natural tears from evaporating and helps to keep the ocular surface of the eye moist by preventing that evaporation. 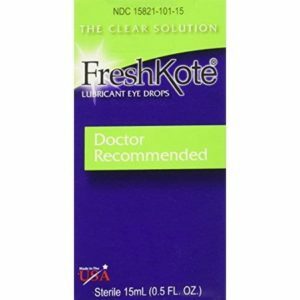 You can purchase a 15 mL bottle of Freshkote lubricant eye drops over the counter. Although, you should always consult your doctor before attempting to treat a condition at home. How are Freshkote Lubricant Eye Drops Different? Before purchasing Freshkote lubricant eye drops you should make sure that this type of eye drop is the best option for treating your symptoms. There are a few different types of eye drops on the market that serve as remedies for different problems. Most people turn to eye drops because they are suffering from dry eyes. Sterile saline eye drops are the mildest form of eye drops. These solutions are free from chemicals and preservatives and are most commonly used to moisturize and clean the surface of the eyes. Sterile saline eye drops are commonly used by people who wear contact lenses in order to keep their lenses wet. This should never be used as contact lens solution, however! Sterile saline eye drops are not able to treat more severe dry eye symptoms. Freshkote lubricant eye drops are artificial tear eye drops. Artificial tears are available over the counter. While sterile saline eye drops are meant to only moisten and cleanse the eyes, the purpose of artificial tear eye drops is to mimic the three-layer components of your natural tear film. Many artificial tear brands use preservatives and chemicals to achieve this. Artificial tears can relieve the symptoms of more serious conditions such as dry eye syndrome, but keep in mind that they’re still not treating the underlying issue. There are also prescription eye drops for even more serious conditions, if needed. Due to its ability to provide support to the three important tear film layers, Freshkote is an excellent remedy for treating dry eyes and eye irritation. These lubricant eye drops treat dryness by wetting the ocular surface and using its lipid-like component to maintain the moisture. Freshkote’s formula is able to accomplish this even though the varying layers of the tears are difficult to mimic. Freshkote is a great solution for treating the eye dryness caused by dry atmospheres, pollution, and contact lens usage, among other things. Freshkote can provide relief for people who are suffering from corneal erosion when combined with medical treatment for the condition. There are a few important precautions to take before using Freshkote lubricant eye drops to treat your eye dryness and irritation. The first step that you should take before purchasing these lubricant eye drops is to check the Freshkote ingredients list and make sure that you are not allergic to any of them. If you are allergic to ingredients in artificial tear eye drops, then you should not use Freshkote. You should also consult your doctor before purchasing Freshkote lubricant eye drops. Alert your doctor to any existing allergies that you may have to certain medications or foods. This can help to make sure that none of the ingredients in Freshkote will trigger or react negatively with these allergies. Likewise, you should inform your doctor, eye care specialist, and/or pharmacist about any medications and supplements that you are currently taking to treat other conditions. You should inform your doctor of everything, whether it is a prescription, over the counter, vitamin, or natural treatment. Doing so will help to avoid the risk of a negative reaction with Freshkote ingredients. Freshkote lubricant eye drops are only safe for use in the eyes, or on the ocular surface. It is important to avoid getting Freshkote in or on other body parts including the nose, mouth, and skin. When you purchase a 15 mL bottle of Freshkote, it will have an insert that contains instructions for usage. It is a good idea to read these instructions and follow up with your doctor, eye care specialist, or pharmacist if you have any questions about the proper way to use Freshkote lubricant eye drops. Freshkote lubricant eye drops can be very easy to use, however it is important that you follow the best method for application. Before applying Freshkote lubricant eye drops, it is important that you thoroughly wash your hands using an antibacterial soap. You should be sure that your hands are clean each time you use the eye drops. This will help to avoid eye infections that can be caused by the transfer of bacteria onto the product. If you wear contact lenses, you should remove them before applying Freshkote lubricant eye drops. Once your hands are clean, you may open the product and begin the application process. Begin by tilting your head back and gently pulling down on your lower eyelid. This will create a pocket. Apply a single drop of Freshkote into this space while looking in an upward direction. After you have applied one drop of Freshkote, close your eyes and press down on the corner of your eye closest to your nose for at least one to two minutes without blinking. After one to two minutes of applying pressure to the corner of your eye, you can wipe off any extra tears that may have ended up on your face. While applying the eye drops, it is important to avoid contact between the surface of your eye and the eye drop applicator. Over time, bacteria and other germs can grow on the applicator. Having these pathogens transfer onto the surface of your eye can lead to big problems such as bacterial eye infections. Always close your bottle of Freshkote tightly and store it at room temperature away from light and moisture. It is not suggested that you keep your Freshkote eye drops in the bathroom. Bathrooms provide a lot of opportunities for cross-contamination and tend to be very moist environments. If you share a bathroom with other people, especially children, then you should avoid leaving your Freshkote drops in the bathroom in order to avoid the risk of other people using them. Sharing eye drops can increase the risk for infections. When using Freshkote to treat eye irritation it can be tempting to use multiple doses for instant relief throughout the day. This can cause problems such as continued dryness or an overdose, and reactions can occur due to the preservatives. You should never take more than the dosage recommended by your doctor, eye care specialist or pharmacist in order to prevent worsening of your condition. If you make the mistake of missing a dose, then the best action to take is to use the missed dose as soon as you realize that you have missed it. If it is close to the timing of your next planned dose, then you should skip the missed dose and get back on schedule. Proper usage can avoid many of the negative side effects and reactions associated with using Freshkote eye drops. 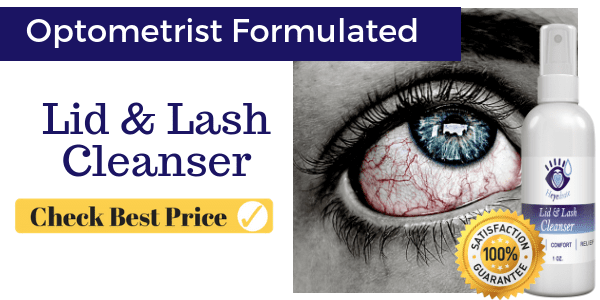 If your dry eye symptoms are affecting your eyelid and eyelash areas, then you may want to consider purchasing a lid and lash cleanser like Heyedrate. This is also a great way to disinfect this area before using your Freshkote eye drops to avoid infections. Heyedrate is a natural, organic, and vegan option for treating dry and irritated eyes and eyelids. Having clean eyelids can help to avoid many common eye problems such as dry eye syndrome, blepharitis, styes, and dryness from the use of contact lenses. This can also help to avoid infections by reducing the number of bacteria that can be transferred between the eyelids and the eyes. This product can also fight bacteria that grow in the skin and mucous membranes. 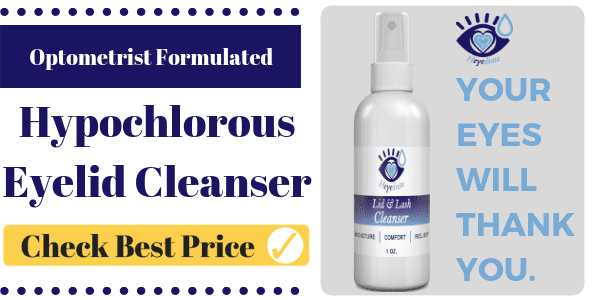 You can use this product to clean your nose, skin, and other areas of the body. Although Freshkote is very beneficial to people who are suffering from dry eye syndrome, this remedy is not without its side effects. With any drug or medication, side effects and negative reactions are a risk. If you experience vision changes, pain in or around the eye, or redness and irritation that won’t go away then you should contact your doctor as soon as possible. You should also contact your doctor if your dry eye syndrome gets worse or if your symptoms are not reduced after 72 hours of correctly using Freshkote. Many of Freshkote’s negative side effects can be avoided through proper usage. Since this product is used for the eyes, it is very important to avoid contamination. You should avoid letting the tip of the bottle touch any surface. Exposure to un-sanitized surfaces can cause excess germs to be transferred onto the product. These germs will be passed on to your eye as you use the product, which can lead to eye infections. You should also take care in noticing any changes in the color or appearance of the eye drops. This can be a sign of expiration or contamination. Contact lens wearers should use extreme caution when using Freshkote. These eye drops are not suitable for use while wearing your lenses. You should avoid direct contact between Freshkote eye drops and your contact lens. After using Freshkote, you should wait at least 15 minutes before putting in your contact lenses. It is important to never apply Freshkote lubricant eye drops at the same time that you apply other eye drop solutions. If you are currently using another type of eye drops to treat other symptoms, then you should not apply them within 5 minutes of using Freshkote in order to avoid reactions, and to get the best benefit of both drops. Freshkote users on Amazon give the product an average rating of 4.3 out of 5 stars. The reviews praise the product’s benefits as being effective, long lasting, and fast acting. Some reviewers complain of the product causing a layer of “crust” to build up on the eyelids and along the lash line, however a lid and lash cleanser such as Heyedrate, can provide relief from this side effect. Freshkote reduces oncotic pressure. Dry eye syndrome and abrasions can damage the epithelium of the cornea, or front of the eye. This allows a buildup of water to accumulate which can lead to swelling and pressure. In more serious cases this damage can lead to corneal erosion. The pressure that is built up due to damaging the epithelium can lead to pain in the eye area. Freshkote reduces this pressure and maintains a healthy level of tears on the surface of each eye. These eye drops can also begin to remove excess water and heal the damage done to the epithelium. They can also provide instant relief from this symptom. Freshkote restores your tear film osmolarity. Tears must consist of the three main components (water, lipid, and mucous) in order to create a protective film for the eyes. Freshkote eye drops help to restore balance to natural tears by mimicking each of these components and improve the quality of your eye’s tear film. A perfect level of osmolarity is needed in order to protect the epithelial cells of the eye. Freshkote restores the lipid layer of the tear film. Although we tend to think of tears as primarily a liquid substance, the other layers of the tear film are essential for healthy eyes. It is very important to have a healthy amount of lipids within your tear film. An inadequate lipid layer is one of the main causes of dry eye syndrome. According to the National Eye Institute, this is the root cause of up to 75% of all cases of dry eye syndrome. Without the lipid layer, tears can evaporate from the surface of the eye at a much faster rate, leading to dehydration. Freshkote remedies this by restoring the lipid layer of your eye’s tear film. Freshkote uses a non-irritant, patented preservative called Polixetonium. This preservative is both antifungal and antimicrobial. Polixetonium is patented by the manufacturer and is a great help in keeping the surface of the eye moist while providing protection for pathogens that can cause even more eye health issues. Many of the negative side effects of using Freshkote lubricant eye drops can be avoided with proper usage and guidance from your doctor. One of the best ways to avoid a negative reaction with Freshkote is to be certain that you are not allergic to any of the product’s ingredients prior to usage. You should also double check to ensure that none of your pre-existing conditions are known to cause a negative Freshkote reaction. It is very important to consult your doctor or an eye care specialist before using Freshkote. Another downside of Freshkote is the fact that there are a few groups of people who have to miss out on its benefits due to the risk of a negative reaction to the lubricant eye drops. If you are pregnant, nursing, or attempting conception, then it is best to avoid Freshkote. Anyone who is currently taking any type of medication already should be aware of the potential for these medications to interact negatively with the use of Freshkote. Furthermore, if you are prone to allergic reactions, then using Freshkote may not be a wise decision for you. Another thing to look out for when using Freshkote is the risk of a Freshkote overdose. This can happen if you take multiple doses at the same time. It can be tempting to double up on your dose of Freshkote with the hope of relieving your dry eyes faster. However, Freshkote is a medication like any other, and you should follow the dosage instructions provided by your doctor and/or pharmacist. Freshkote lubricant eye drops should be stored at room temperature. It is very important to pay attention to the product’s expiration date. Expired Freshkote eye drops should not be used. Because Freshkote can be toxic if ingested, it is important to store your eye drops in a place where your children and pets cannot access them. If you have expired Freshkote, then you should dispose of it immediately in order to avoid accidental usage. You can dispose of any unused product by throwing it in the trash. Avoid flushing Freshkote down the toilet or pouring it down your drain. And now, here’s a little bit more about dry eye syndrome to help you understand if that’s what you’re suffering from, and ultimately, if Freshkote is the right solution. Dry eye syndrome develops when your eyes do not have a constant layer of protective tears on their surface. Tears keep your eyes healthy by providing moisture that washes away debris, dust particles, and germs. These foreign objects have the ability to damage your cornea and cause eye infections. Some people make the mistake of thinking that tears are just water. That is why so many people are confused when their dry eye syndrome causes watery eyes. However, our eyes need more than just the water-like component when it comes to tears. A healthy layer of tear film actually includes three components: an oil/lipid layer, a watery layer, and a layer of mucus. Each of these layers provides a different type of protection for the eyes. The oily layer decreases eye dryness but slowing the evaporation of the watery layer. The mucous layer helps tears to be transferred throughout the surface of your eye. Lacking in any of these layers can create irritation, dryness, and inflammation. Those who suffer from dry eye syndrome may also experience a feeling that a foreign object is in the eye. This can lead to rubbing and scratching that may worsen the symptoms of dry eye syndrome. Watery eyes are an unexpected symptom of dry eye syndrome. This syndrome can cause watery eyes because your eyes tend to ramp up tear production in an attempt to protect themselves. The tears produced from this symptom are low quality and do not provide adequate protection for the eyes. If you suffer from dry eye syndrome, then you will be happy to know that there are many treatment options for this condition. The first step to treating less severe cases of dry eye syndrome is to modify the behaviors and environments that contribute to your symptoms wherever possible. For some people, doing this improves their condition so drastically that no further action is needed. 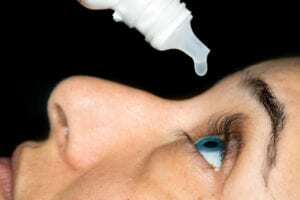 If you have modified your behavior and environment in every way that you can and are still suffering from the burning, itching, and irritation that dry eye syndrome causes, then it may be time to speak with your doctor about using lubricant eye drops that act as artificial tears. Many people suffering from dry eye syndrome find relief by using Freshkote. 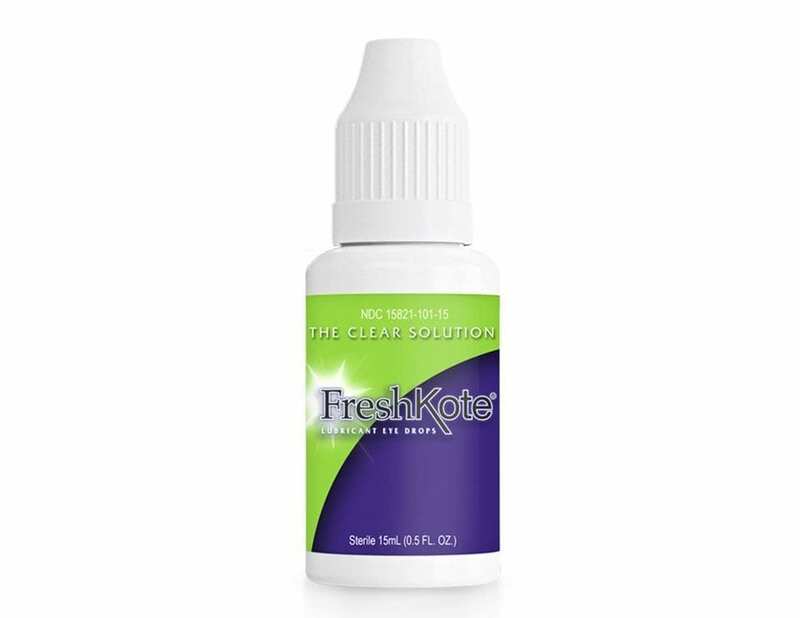 All in all, Freshkote is a highly effective, fast acting remedy that can alleviate many dry eye symptoms including itchiness, redness, irritation, pain, and soreness in the eye area. When paired with proper usage of secondary products like Heyedrate, an organic, vegan, and natural lid and lash cleanser, it can alleviate the disruptive symptoms of dry eye syndrome. Freshkote is available over the counter at many common drug and retail stores. As with any medical treatment, be sure to consult with your doctor before using Freshkote lubricant eye drops to treat your dry eye syndrome.